The T14-3-3 (S71L&I72V) - T14-3-3 consists of a wildtype monomer and a monomer with two mutation. The 71th amino acid is changed from serine to leucine and the 72th amino acid is changed from isoleucine to valine. This heterodimer is a scaffold protein and originates from the Tobacco plant. Protein-protein interactions can be induced on this scaffold by linking proteins of choice to the CT52 protein, a protein with a known interaction with this scaffold protein. The mutation on this protein is designed by iGEM TU Eindhoven. Specifications of this mutations can be found here. The 14-3-3 proteins are a family of proteins which are well preserved in evolution and are present in all eukaryotic cells. 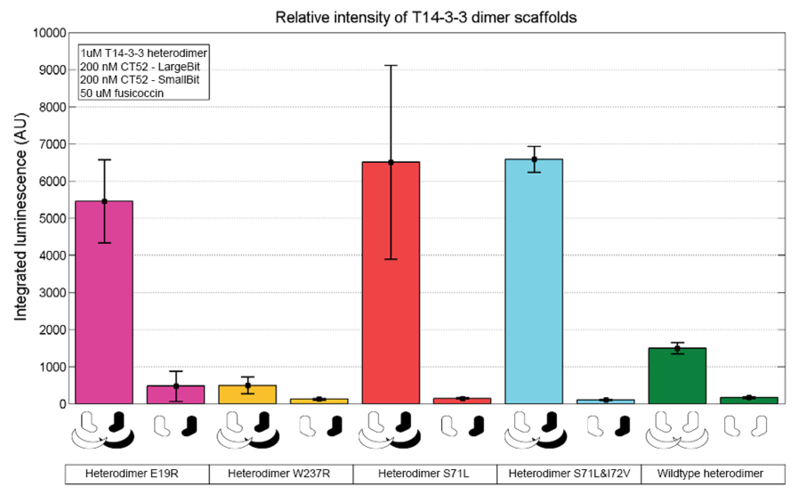 From the fact that there is a high diversity of interaction partners of the 14-3-3 protein, can be concluded that 14-3-3 contributes in many cell processes. Examples of regulating and coordinating cell processes where 14-3-3 plays a role are cell cycle progression, apoptosis, metabolism, transcription, regulation of gene expression and DNA damage repair. With the help of the Rosetta software package, a molecular structure predictor that includes several algorithms for computational modelling and analysis of protein structures, new mutations for the T14-3-3 protein were found. A heterodimer is created to enable the assembly of two different protein-CT52 complexes. Orthogonality is introduced to ensure minimal interaction with the natural processes in that organism. These mutations have to be orthogonal with respect to the CT52 constructs. The mutation found by Rosetta is S71L&I72V, thus changing the 71st amino acid from a serine to a leucine and changing the 72nd amino acid from an isoleucine to a valine. The T14-3-3 dimer now consist of a wildtype monomer and a monomer that contains the mutation S71L&I72V. The scaffold protein can therefore bind two different CT52-protein complexes. The statistics of this protein can be found below. Figure 1: Snapgene map of BBa_K2065006. 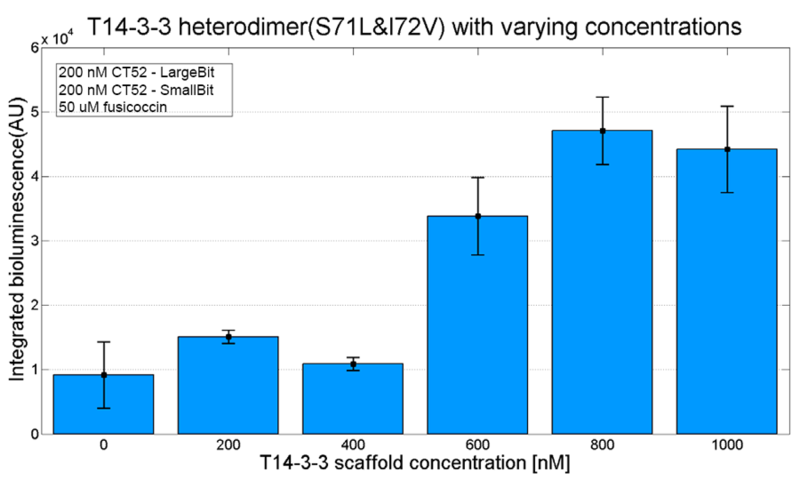 To verify the orthogonality and activity of T14-3-3 (S71L & I72V) – T14-3-3 scaffold, in vitro assays have been performed with NanoLuc split luciferases linked to CT52. The NanoLuc reporter system consists of a small and a large bit, when those two are dimerized they are able to activate an luminogenic substrate which emits bioluminescence at a wavelength of 460 nm. The small and large bit of this NanoLuc reporter system are called: SmallBiT and LargeBiT. The BioBricks of this NanoLuc reporter system linked to CT52 are <a href="">BBa_K2065000</a> and <a href="">BBa_K2065007</a>. To verify whether the mutation was a working mutation it was compared to the control mutation T14-3-3(E19R). This showed T14-3-3(S71L&I72V) - T14-3-3 is a functional scaffold. 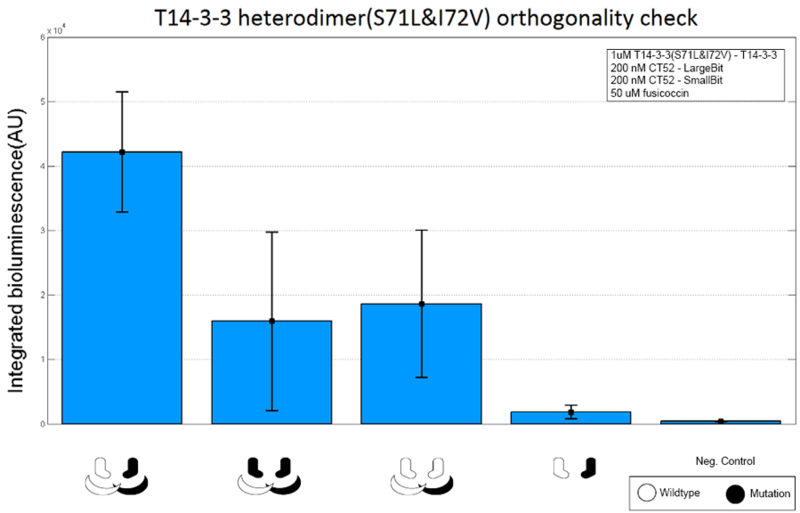 Figure 2: T14-3-3 functionality measurement representing the relative intensities from each mutation set. The scaffold concentrations used are 1 µM. 50 µM fusicoccin was used for all measurements. CT52-LargeBiT and CT52-SmallBiT were used with a concentration of 200 nM, CT52-LargeBiT contained the mutation. The substrate used was 1250x diluted from stock. To verify whether the scaffold shows the expected activity the activity of the scaffold at different concentrations was measured. Below a bar graph with the integrated bioluminescencescence over a timespan of 20 minutes. This reinforces that T14-3-3(S71L&I72V) - T14-3-3 is a functional scaffold. To check whether this heterodimeric scaffold protein is orthogonal, the following was done. The magnitude of the integrated bioluminescence for complementary CT52-split NanoLuc proteins ( CT52(I947F)-LargeBiT and CT52-SmallBit) was compared with three other situations. The first one consisted of two mutated CT52-split nanoluc proteins (CT52(I947F)-LargeBiT and CT52(I947F)-SmallBit) instead of one wildtype and one mutated CT52-split nanoluc protein. The second one consisted of two wildtype CT52-split NanoLuc proteins (CT52-LargeBiT and CT52-SmallBit). The last one consisted of the two complementary CT52-split NanoLuc proteins without scaffold present. As a negative control substrate without scaffold protein of CT52-split NanoLuc proteins was used. This is visible in figure 4. For the conclusion about the effectivity of this mutation visit "http://2016.igem.org/Team:TU-Eindhoven/Results/Conclusion". Figure 4: T14-3-3 orthogonality measurement with 1 µM T14-3-3(S71L)-T14-3-3 for bar 1-3, 0 µM T14-3-3(S71L)-T14-3-3 for bar 4 and 5. 50 µM fusicoccin for bar 1 -5. Mutant forms CT52-LargeBiT and CT52-SmallBiT are present in different combinations. Bar 1: CT52(I947H)-LargeBiT & CT52(wildtype)-SmallBiT, bar 2: CT52(I947H)-LargeBiT & CT52(I947H)-SmallBiT, bar 3: CT52-LargeBiT & CT52(wildtype)-SmallBiT, bar 4: CT52(I947H)-LargeBiT & CT52(wildtype)-SmallBiT and bar 5: No CT52-LargeBiT or CT52-SmallBiT present. The substrate used was 1250x diluted from stock. – Ottmann, C., Marco, S., Jaspert, N., Marcon, C., Schauer, N., Weyand, M., Vandermeeren, C., Duby, G., Boutry, M., Wittinghofer, A., Rigaud, J. and Oecking, C. (2007). Structure of a 14-3-3 Coordinated Hexamer of the Plant Plasma Membrane H+-ATPase by Combining X-Ray Crystallography and Electron Cryomicroscopy. Molecular Cell, 25(3), pp.427-440. - Obsil, T. and Obsilova, V. (2011). Structural basis of 14-3-3 protein functions. Seminars in Cell & Developmental Biology, 22(7), pp.663-672. - Milroy, L., Brunsveld, L., & Ottmann, C. (2013). Stabilization and Inhibition of Protein–Protein Interactions: The 14-3-3 Case Study. ACS Chem. Biol., 8(1), 27-35.